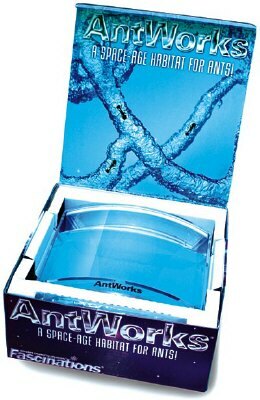 The Original Blue Gel AntWorks ® Habitat. Habitat was developed after years of NASA space research. What are the effects of zero gravity on any life form. This unit includes everything you need to get your unit up and running besides the live ants. Don't worry we sell them. We know it sounds crazy who wants ants in their house.... Hmmmm we can think of quite a few people. This makes a wonderful gift for the person who has everything. This makes a great educational science toy as well. Watch the ants create an intricate maze of tunnels in the habitat. ▪ Fascinations AntWorks ®habitat Instruction book. Learn interesting facts about these live ants. Antworks Habitat the playhouse for ants. What is this cool product you ask? Well I'll tell you. This is a self sufficient farm like community for ants. You basically pour your big juicy ants ( we sell them) into the unit and they go to town. These guys will scurry around burrowing holes in the Nasa Space age gel. They use this gel for water and food and no feeding it required. 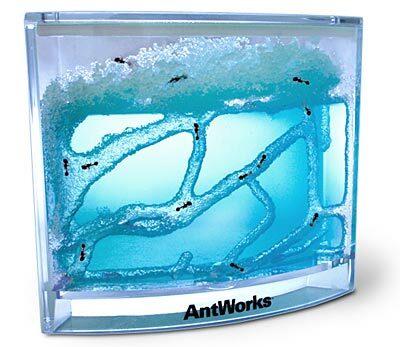 The Antworks Habitat makes a great gift for people of all ages. It comes with a nifty magnifying glass so you can watch them. The ants we provide are big enough though so don'tscare yourselves with the close ups. It also has the starte want that can be used for catching the ants but i wouldnt suggest playing with these little guys. Want something that will make your Antworks habitat a little cooler. Well check out the illuminator which is an add on led base unit that makes the habitat appear to glow. With 4 led lights this puts out plenty of lighting. It can even be used as a childerens night light.